Description The version 2.0 70km SMAP-SSS level 3, 8-Day running mean gridded product is the second release of the validated standard mapped sea surface salinity (SSS) data from the NASA Soil Moisture Active Passive (SMAP) observatory produced operationally by Remote Sensing Systems (RSS). There are no changes to the underlying salinity retrieval algorithm with this release, just an increase in the spatial resolution of the data from 40km to 70km to reduce some of the observed noise. Daily data files for this product are based on SSS averages spanning an 8-day moving time window. SMAP data begins on April 1,2015 and is ongoing, with a one-month latency in processing and availability. L3 products are global in extent and gridded at 0.25degree x 0.25degree with an approximate spatial resolution of 70km. The SMAP satellite is in a near-polar orbit at an inclination of 98 degrees and an altitude of 685 km. It has an ascending node time of 6 pm and is sun-synchronous. With its 1000km swath, SMAP achieves global coverage in approximately 3 days, but has an exact orbit repeat cycle of 8 days. On board instruments include a highly sensitive L-band radiometer operating at 1.41GHz and an L-band 1.26GHz radar sensor providing complementary active and passive sensing capabilities. Malfunction of the SMAP scatterometer on 7 July, 2015, has necessitated the use of collocated wind speed, primarily from WindSat, for the surface roughness correction required for the surface salinity retrieval. Citation Remote Sensing Systems (RSS). 2018. 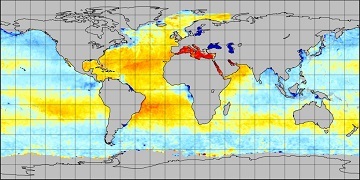 RSS SMAP Level 3 Sea Surface Salinity Standard Mapped Image 8-Day Running Mean V2.0 70km Validated Dataset. Ver. 2.0. PO.DAAC,	CA,	USA. Dataset accessed [YYYY-MM-DD] at http://dx.doi.org/10.5067/SMP2A-3SPCS. Journal Reference Meissner, T. and F. J. Wentz, 2016: Remote Sensing Systems SMAP Ocean Surface Salinities, Version 2.0 validated release. Remote Sensing Systems, Santa Rosa, CA, USA.